"Big diameter" Roller Auto Dyne with MC adapter - NOT RECOMMENDED due to excessive inertial mass on the auto dynes for MC use. 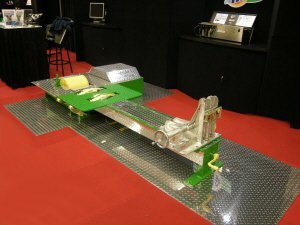 Show with optional "Green Flash" package and optional aluminum Wheel Chock. 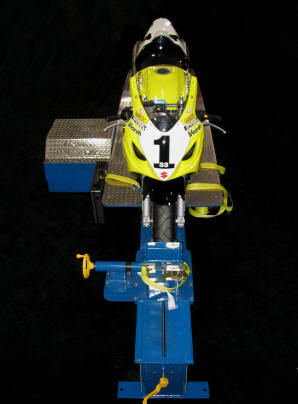 #1 Vesrah Racing, Racing (until 2012) and Suzuki NZ use the EC997 Dyne System. note positive clamping front wheel chock and sturdy wheelbase adjustment. The most well developed High Speed, low inertia, 4 gas EGA Eddy Current Dynamometer in the world. Not just "load control" - it's DLC, Factory Pro's exclusive Dynamic Load Control. Our DLC systems absolutely and actively control sweep rate, accommodating engine power changes and flat spots, so 125's to 1400cc - all have proper loading, not uncontrolled sweep rates and heavy drive roller "Neanderthal" technology. 2008, Feb. Dynojet just sent out an email showing other brands of dynos and tire slippage on those other dyno brands. They claimed the "they" have the "best traction" (arguing that implies that the "other dyno companies" haven't figured out to knurl a drive roller in 50+ years)......... I guess that they forgot to ask Dusty and the other DJ guys that ran their dj dyno at the AMA Races......... and when they loaded 2 people on a bike at Road Atlanta, they used one of the "largest dudes that I'd seen that weekend" as the second guy - With 2 guys AND super tightly strapped - it still slipped. It was a long weekend and I was napping in the truck w/ the AC on. Paul Riccio was in the passenger seat, eating lunch - He woke me up with "Awww... heck - Dynojet's got Traction Control." I opened my eyes, because I'd never seen dyno traction control, to see a ~300# DJ guy leaning over the back of the bike for more weight.......... still slipped when it hit the powerband. In those youtube movies that were in that dj press release, they showed a bunch of "other" brand dynos with dj style "knurled" driver rollers, slipping - but - but! There was not a single youtube movie of the patented Factory Pro slotted drive roller slipping. On the patented Factory Pro drive roller, you can even be doing a full throttle, Steady State test at 130 True HP levels - throw 32 oz of water on the tire / drive roller. It goes "whoop!" for an instant and then immediately settles back into full traction. And that's even on an almost 15 year old Factory Pro drive roller! Let's see the their movie of "DJ good traction" in a steady state test and a 32 oz dump of water on the drive roller on a 15 year old dynojet! You'll never see it - because it's impossible. You can walk right up to the bike, as the front wheel beam is only 12" wide instead of other company's space wasting rectangular dyno chassis footprint. Factory Pro has maintained the world's largest 4 gas EGA emissions tuning database, including initial, intermediate and final data. Keihin and Mikuni and S&S and Edelbrock carbs PERFECTLY. Does it take longer to tune to Best Power and Engine Smoothness as compared to "autolink" "tune to an af ratio" on a dealership level dyno? Not really. A TEKA 4 or pc3usb on an HD can be tuned to Best Power and Engine Smoothness in less than 30 minutes - as compared to about the same time, but still only kinda "close" to right on the tuning with DJ "autolink". one trick ponies designed to sell the dyno manufacturer's own boxes to the exclusion of easy tuning on other products - They are not common, simplistic "tune to an air fuel ratio" elementary level dynos - These are well developed systems designed for optimal tuning using any FI or carb system you can get the software or parts to tune - ands amazingly, they are often simpler to use than silly "AFR" auto-tune dynos. Too good for your customers? Want a quick quad built and tuned? Use the same dyne for 2 and 4 wheeled vehicles. Use for facilities that work on Quad and motorcycles, such as Vickery Yamaha in Denver and Naumes Oregon MS in Medford, OR. (patented slotted design delivers 33% better traction than knurled drive rollers without tire damage as in knurled drive rollers). As used by Vickery Yamaha, Denver, CO and Naumes Oregon Motorsports, Medford, OR. 2008, Feb. Dynojet just sent out an email showing other brands of dynos and tire slippage on those other dyno brands. They claimed the "they" have the "best traction"......... I guess that they forgot to ask Dusty and the DJ guys that ran their dj dyno at the AMA Races......... and when they loaded 2 people on a bike at Road Atlanta, they used one of the "largest: dudes that I'd seen that weekend" as the second guy - With 2 guys AND super tightly strapped - it still slipped. It was a long weekend and I was napping in the truck w/ the AC on. Paul Riccio was in the passenger seat, eating lunch - He woke me up with "Awww... heck - Dynojet's got Traction Control." I opened my eyes to see a ~300# guy leaning over the back of the bike for more weight.......... still slipped when it hit the powerband. Blast yourself far beyond the other dyno guys who think that "tuning to an AFR" and a good "4th gear wack" is the extent of "good" tuning. The Factory Pro Legend Series dyne system is specifically designed for Legend Cars and vehicles of the similar size and power. Drum spacing is 64" outside-to-outside and it, like all Factory Pro EC997 series dynes, is a "brake" dyne system and NOT an inertia "dyno" like other dyno manufacturers palm off as "state of the art". Because it's not an inertia dyno, you can actually tune optimally, and not to grade school "air fuel ratio". 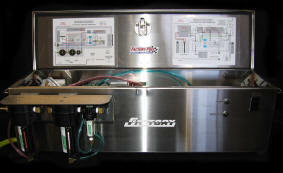 Over 18 years ago, Factory Pro engineers designed and developed what has now become, not the "industry standard motorcycle chassis dynamometer", but the Best Dyne systems to use for day to day tuning - and - for high accuracy R&D for engine builders, pipe builders, turbo and nitrous tuners. 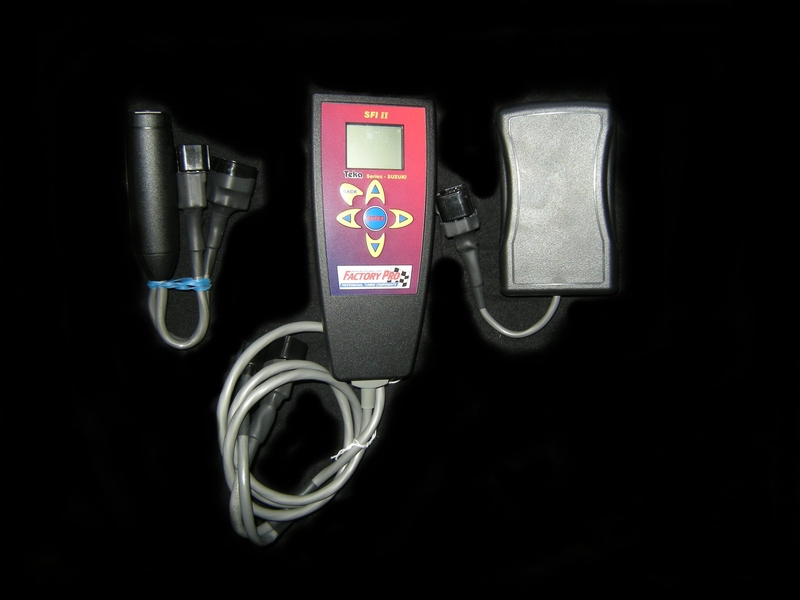 The Factory Pro EC997 Dyne Systems were built to be used to combat erroneous dyno data from cheap inertia dynos. Data from inertia dynos was often times significantly different from what worked Best on the street or track - and as a research and development tool for Factory Pro's #1 AMA choice carburetor kits and ignition advancers. Currently, there are over 100 units worldwide and the rest of the world is still bumbling around "tuning to an air fuel ratio". Chassis dynes eliminate the need for engine removal for power testing and tuning, the vehicle mounting time is less than 5 minutes - as the EC997 systems are 6" lower than the dj dynos. Claiming that "a technician can then perform a simple 10 second test and examine the results right in the shop" is a ridiculous claim (and WE don't claim that). You can't even do a sweep test form low to high rpm in much less than 10 seconds, and even more, slow that 900# heavy drive roller back down to a stop on the "claimant's" dyno in 10 seconds. So - no, you can't do a 10 second sweep and get any decent tuning information - it'll take us about 5 minutes to do a complete set of steps and then, using Factory Pro's 4 gas EGA information, figure out jetting, fuel injection AND ignition timing information. You'll get 4 times the tuning information in 5 minutes of EC997 testing - allowing you to make more changes after just 1 test - ultimately getting more work done, to a higher standard with minimum engine "runtime". Utilizing the EC997's unique "Power Smoothness" software, the dyno operator can evaluate the entire drive train for the purpose of routine servicing or performance development. That's unknown on competitor's dynos. Factory Pro's Northern California location, in close proximity to the world renowned Silicon Valley, provides us with access to the latest and most technologically developed chips and microprocessors to deliver all the True HP precision in power measurements that a motivated technician needs to make quick and accurate evaluations of engine tuning and drive train performance. This allows even a dealership level user to maximize your shop's potential with increased sales, service efficiency, and shop credibility. The EC997 dyne system's durable, maintenance-free construction ensures that you will be investing in many years of flawless tuning and troubleshooting. If you care about being the best, using the best equipment and doing the best possible job for your customers and product design to gain your reputation, the Factory Pro EC997 Dyne Systems are the #1 choice. 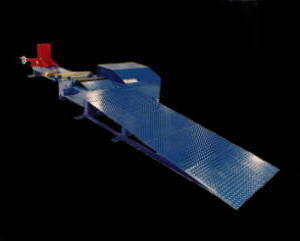 Use the same dyne for 2 and 4 wheeled vehicles MOBILE. Quickest Reading Hi volume integrated system in the world. 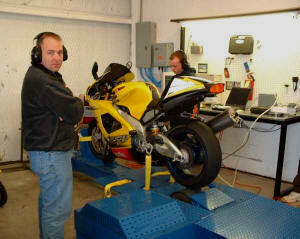 It's 2008 and the motorcycle dyno industry is 90%, still in a horsepower mess. You read one motorcycle magazine and see that the new, current 1000cc sportbikes are making over 170 to 179 rear wheel horsepower on their "engineering" level dyno - Wow!! Then you see another magazine that the same model bikes of the same brands are making 160 on another brand dyno! Then you see another magazine test and the bikes make, even still, more different hp numbers! Then you take your new 2006 1000 and go to your local dealership level dyno and get a less than 160 "hp" reading and then - you go to a dealership level dyno at another and get a 5% higher or lower reading than that - even on the same brand dyno!! So - either one magazine is getting special "magazine bikes" and the other.... or..... is that it? Does the weather affect the hp THAT much? Does your bike gain and lose 5% power as temp changes 10 degrees? Can't SAE correction factors correct for that? (yes, SAE correction factors work quite well). That's pathetic for the industry and it makes it utterly useless to take hp figures and compare them. What with the HP inflation factors? We already knew that each of these company's dynos tended to read different - up to 4% to 6% different in power readings. Even a strong magazine did a test to expose that - but the USA magazines ignored that and it seems that they have, at best, fell back onto the old "you have to use the same dyno" if you are doing development work.... So... What's that mean if they publish HP numbers that don't really equate to what you might get on your local dyno? I never thought that I'd have to specify that our information was on a "True" scale - but - so be it! The other dyno companies can complain all they want, but - they each have the ability to provide the real numbers and they can read out in True HP, also..... so it's their choice as to providing real or inflated numbers to a wandering scale. Factory Pro is your company of choice. Official HP Interrogator of F-USA!! March was a great month - met lot's of great people - good tuners and people that will evolve from darn good to great tuners with their new Low Inertia EC997 Eddy Current dynes and Teka SFI equipment. Gary and Jason stand out as dedicated to their work and if you know a Gary or a Jason - you might check out if they've got a new "tool" to help them help you! On the other hand - as the yin and yang of life goes - We also met some people who weren't at all interested in why or how their product worked - or if it worked well at all! Well - that's right, you guessed it... The EC997 showed them what was wrong and right with the product. Ooops. Crestfallen. A little bit of probing - Well, the product will never work well enough for me to say that I'd use it, as it is. And if I wouldn't use it - I wouldn't sell it, either. Did they want to fix it? No! Wow. They just wanted to see big power increases with their product. But with really good marketing (and, production-wise, they good at that! )- I'm sure that they can sell enough to cover some costs - but - not to me. The "correct" parts of the concept are similar to what we've been working on for a few, long years in the Teka EMS system. Using an existing analog signal to generate a different ECU output has been around for some time now - and for a lot less than they thought that they could sell their thing for. They had to buy a different dyno that showed them that they had a great product to sell! See it soon! I'm sure they will call it "state of the art"! Probably in an HD or Cruiser magazine. "If there were two brands of dynos and there was race to see who could do a run first, who would win?" WOW! Lessee.... Did you want to type in the customer's name? bike type? carb or FI settings? No, just "Who could make a run first." Exhaust? Did you want high accuracy? Just "Who could make a run first." Repeatability? Just "Who could make a run first." Are you trying to tune or just snag $40 from the rider or are you going to try to test and be able to help the rider make the tuning better? Just "Who could make a run first." The EC997 dyno, in Sweep Test , takes no more than time than other dynos and less than most, if you have to load the bike (only takes 1 person), strap the bike down (1 tiedown ratchet straps both sides of the bike down evenly, 1 person), and even if you use rpm (which they don't usually). Less time. Most of the time. The EC997 - being tuner oriented - First - can actually do those 2-3 second powered realtime power tests easily in steady state mode (steady state is where you get the most power and gas information), unlike some "other" dynos. Imagine changing 3 different PID loop values to try to get the dyno to hold a steady rpm under load at each rpm stop point!!! (ask math teacher or "other" dyno operator who can actually do a step test) - Our owners don't even know what a PID loop is - because our EC997 dynos never need to be fiddled with! And as far as time? Wow. First - they'd actually have to be able to do a Steady State Test! As good as +/- .2 True HP when properly tuned. Enviable in the industry. So rare that "they" say it can't be done. The EC997 gives more information, in less time - enabling better quality work to a higher level - in less total time - with higher customer satisfaction. DO NOT buy this dyno. and an estimation of possible changes and power gained. 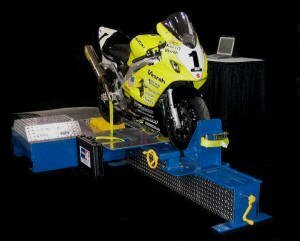 The EC997 dyno owner will have gained a customer - because they provided useful information for the bike owner. The EC997 has the ability to deliver the information to deliver the BEST possible performance - easily. It's the ONLY dyno that can. I am happy to not be associated with a company that really doesn't care about tuning product quality. March 02 was a great month! Just like 1989, when Factory Pro entered the one-brand dominated carb kit world, when we had to throw out what the motorcycle industry had come to be resigned to expect from carb kits, we had to reinvent the dyno and reeducate mc tuners on how accurate and quickly they could provide superior power and mileage for their customers. Unlike dynos with heavy, 900lb. drive rollers, the EC997 is relieved of high system inertia. The Low Inertia EC997 Series will display the roughness of even 1 cylinder slightly missing - allowing you to isolate even 1 poor cylinder - saving hours of labor caused by blind guessing on other dynos. NO other chassis dyno comes close. I got the new CD / EGA program on Monday from Thomas. The dyno/ega is working great. I really appreciate all of your help! Raised the needle on my YZFzr like you suggested and that surging at 5-6K is gone. Virtually infinite computer and manual load control. What is True Rear Wheel Horsepower tm? Click here to find out! This web site has recently been visited by people. Thanks to www.digits.net for the counter. Subtract 32 because F is "too big" anyway. Then the 5 and 9? Since F is still "too big", you use the 5 and 9 as 5/9 and multiply whatever you got after subtracting the 32 by 5/9th's. or as I remember it... The formula is upside down and reversed from the F--C equation. So - multiply by 9/5 to make the number bigger.... and then add the 32. Everything you do makes the number bigger and it's in reverse order of F-C.